The treatment for carpal tunnel is much the same as the treatment for tendinitis and repetitive strain injury in that what you will do at home will be primarily the same. The health professionals you will seek are the same and they will decide the appropriate treatments. The first thing you need to do is visit your doctor to clearly identify the issue. Your doctor will give you the recommended treatment for carpal tunnel or whatever injury you may have. Your doctor may refer you to a physiotherapist. ***Please note that this page contains affiliate links to products on Amazon. That means if you purchase from these links, I receive a small affiliate commission which helps me to keep this free site running and alive! You should also know that I will never recommend a product that I do not believe in, have not tested, or do not use personally. The four products listed in this article are items that I personally use and highly recommend. The following are the 15 top tips when seeking treatment for carpal tunnel and other related injuries from jewelry making. 1) Get a Proper Diagnosis: See your doctor at the onset of any pain, burning, strain, weakness tingling or numbness. At the very least your doctor can clearly identify what the issue is or refer you to someone who can. Your doctor will give you information on treatment for carpal tunnel or related injuries and perhaps refer you to a physiotherapist. 2) Take a Break: Take a break from making jewelry if you can. If you are able to take a few days or a week off from over using your hands, you will be that much further ahead in the healing process. Rest is the first treatment for carpal tunnel or any injury. Depending on where you are on the injury scale you may need to break for a longer period. 3) Regular Icing: Whether you can take a break making jewelry or not, it is imperative to ice the area and ice often. Icing is an effective treatment for carpal tunnel and any new injury. Use cold packs, frozen peas or ice wrapped in a small towel for ten minutes at a time. DO NOT ice more than ten minutes and DO NOT fall asleep with an ice pack on your skin as it can cause tissue damage. You will be surprised how much relief and healing you can get if you are diligent about icing regularly. It is very important to ice right after working as well as at the end of a work day. You can ice very often just not for more than ten minute intervals and you must wait for the area to warm to normal temperature before icing again. If you are suffering from Tennis Elbow, and you can stand to do this, get a fairly deep and wide bowl and fill it with ice water. Dip your elbow into the bowl for a short time. Do not do this for a prolonged period, but I am pretty sure you will not want to anyway. A chiropractor told me to do this as a treatment for tennis elbow many years ago. It is very effective, but I found I could not really do it for longer than a minute as I have an allergic reaction to cold that causes hives. If you can stand this one, it is very penetrating and an effective treatment for tendinitis. 4) Ibuprofen: If you know that you can take Ibuprofen and have no health issues associated with taking ibuprofen you may find it helpful. While you want a treatment for carpal tunnel and related injuries and not just a mask, ibuprofen has a benefit that regular pain relievers do not have. They work on reducing inflammation and that is very beneficial in the treatment for carpal tunnel and such. In my opinion taking an anti inflammatory medication is very useful as long as you don't find yourself forever taking them to mask pain. The goal is to treat and heal the issue completely. Certainly when an injury is acute an anti inflammatory is an effective treatment for carpal tunnel and any injuries that may have symptoms of swelling and inflammation. 5) Physiotherapy: Physiotherapy can be very helpful as a treatment for carpal tunnel as well as RSI and all tendonitis issues. They offer ultrasound to heal the tissues as well as other treatments and exercises. 6) Chiropractic Care: Chiropractic care can also benefit in the treatment of carpel tunnel and related injuries depending on your chiropractor and your particular injury. Some chiropractors do much more than just adjustments. Some will also use ultrasound as well as using a unit that has little gel pads that connect to your body. The little pads are connected to wires that send small electrical pulses to tire out the area and relax the muscles. I highly recommend that if you choose to see a chiropractor you seek one who uses the activator method. 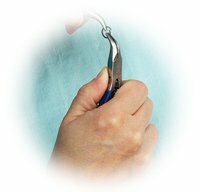 The activator is a small tool that allows them to administer precise, yet gentle, adjustments without manual manipulation. I will no longer see a chiropractor who does manual adjustments as I find it too invasive. That is just my preference. 7) Dr. Ho: You can also buy a similar little unit to the one that physiotherapists and chiropractors use. It is by Dr. Ho and you can find it online by looking up Dr. Ho. I have owned one for years and found it very beneficial for neck related arm pain, tennis elbow and shoulder stress. Although Dr. Ho mentions the use of his product on wrists I would get some professional advice or read up more on the Dr. Ho before using it as a treatment for carpal tunnel. You may get relief using this product where your neck meets your shoulders if that is also the source of your wrist issues. You can click on the image below to see one on Amazon. 8) Paraffin Bath: Many years ago I started to dabble in decoupaging large pieces and applying an antique crackle over top of my pieces. In order to get the nice swirly intricate crackling that I love I had to apply two coats with a large brush and work quickly using a twisting and swirling motion. I cannot tell you the havoc that wreaked on my wrists and hands when I first started. I had to go for physiotherapy. I referred to it as a "freak decoupage accident." Although it was not funny at the time, it was amusing that I could injure myself while crafting. Who would ever suspect that decoupage would cause such a thing? When I went for treatment they dipped my hands into a paraffin bath. WOW! I was immediately sold! They dip your hands into the melted paraffin, then they put little baggies on your hands and cover them with a terry mitten. I cannot express the relief of the penetrating heat from the wax and it lasts for about twenty minutes. A Paraffin bath is also effective for relieving arthritis of the hands. I loved it so much I went out and purchased a paraffin bath. 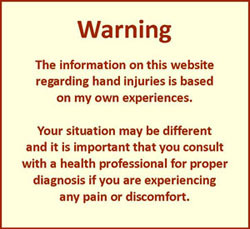 One word of caution *** there are times when heat is NOT a good idea, as in the onset of carpal tunnel when pain is acute. Heat can have the opposite affect and cause more damage. It is very important to know what you are treating and have approval for use of heat from someone who really knows their stuff. For example: at the physio appointments they where treating my hands with paraffin bath heat as well as my neck and shoulders with a heat compress. Over the weeks my neck and shoulders began to worsen and I had to let the physiotherapist know that the heat was making it worse. You would think that as a professional he would know but even some professionals can make mistakes and you must verify whether heat therapy will cause damage, especially in the treatment for carpal tunnel. A quick note on paraffin baths/spas: they take a long time to heat up because they have to melt about three pounds of wax. If you know this going in you will not be disappointed if it takes longer than expected. Make sure to read the instructions thoroughly in order to get the quickest heating possible. Here is a paraffin bath that is moderately priced. It is not the same one that I have, however 71% of the reviews are four and five stars and it is much like the one I use at home. There are a couple of paraffin baths with better reviews, if you are willing to spend about three times the price. Click on the image to see it on Amazon. 9) Alternating Heat and Cold: While heat may not be advisable for some types of injuries alternating heat followed by cold can help bring circulation to the area and for accelerate healing. Check with your health care specialist before applying heat. 10) Prescribed Strengthening Exercises: While you are in the process of seeking treatment for carpal tunnel or related injuries it is important to build strength in the area in order to support the weakened tendons. You will however, want to do this ONLY upon the authorization of a health professional who will advise you on the treatment for carpal tunnel type injuries. DO NOT prematurely exercise an injured area as you can most certainly do more damage and delay the healing process. 11) Helpful Books: There are many helpful books on Amazon that will guide you through pressure points to help heal injured areas. This particular book comes well recommended. 12) Shiatsu: I have been a lover of Shiatsu therapy since I was 18. It is an old Japanese art of using pressure points along meridians in your body in order to aid the body to heal. A good Shiatsu therapist should be able to help and aid in the treatment of carpal tunnel and other arm, hand and neck strains. When I first injured my hands I saw a Shiatsu therapist and she was able to find the pressure points on my forearms that where related to my hand injuries. It was amazing how she was able to isolate the related muscles that where on hyper alert. 13) Do Not Over Extend: It is very important upon the onset of an injury not to over extend yourself. Your wrists and your arms are in a weakened state. Before starting any exercise get professional advice about what exercises will aid in the treatment of carpal tunnel or other injuries. 14) Wrist Braces: An important step in carpal tunnel treatment, treatment for tendonitis as well as RSI is to immobilize the affected area. Although I wore two braces for eight years, it will not likely be necessary for you to do the same. A wrist brace will not only aid in the healing process, but is vital in how to prevent RSI or further damage when your hands are already injured. Choosing a Wrist Brace - When selecting a brace you will want one that is not just an elasticized band. You want one that has a metal insert the length of the wrist area up to the palm of the hand. This hard stabilizer will support your wrist properly and keep you from making movements that are damaging to your wrists and hands. Velcro tabs are definitely preferable to string pulls. What a pain it is to have to adjust strings on an item you put on and take off several times a day. You should also consider color. I do not mention that for fashion reasons, but for reasons of practicality. A mousy grey or tan wrist splint gets dirty awfully fast and when you work with your hands it is all the more true. I prefer black or dark blue as it is so forgiving and does not show dirt. I had a light grey wrist brace and always felt embarrassed with the show of dirt on them and it doesn't take long for a brace to look slovenly when you are working with all sorts of craft materials. If you are also having a problem with your thumbs you can get a wrist brace that has a thumb inclosure to help immobilize the thumb. If not, then it is much easier to have the full thumb opening for freedom of movement. When to Wear Your Brace - Always wear your brace when you are working and especially when you are doing the tasks that caused the injury in the first place. Wear your brace whenever you feel in pain or your hands/wrists are weak. Wear your brace when you are about to do heavy chores like raking or moving something heavy. This one is important. When the pain is acute you can wear your brace to bed. The brace will help your hands to relax and keep you from twisting your wrist in weird ways while you sleep. I have found, during pain-intense times, sleeping with a brace on, to be very healing. When to Not Wear Your Brace - I think it goes without saying do not wear your brace in the shower, when doing dishes or when washing your hands. Although the braces are washable you will probably want to pick an evening to wash it and dry it overnight. Do not wear your brace when you are getting dressed if you are wearing something delicate such as a silk knit as you will quickly destroy your clothing on the velcro closures. Always put on your brace after getting dressed unless you need the extra support for getting dressed. Do not wear your brace non-stop or you will quickly find that you become reliant and your wrist will get weak. In the beginning you will probably need to wear it all the time depending on how acute your symptoms are. Try to have times away from the brace when either resting or doing light activities in order to maintain hand and wrist strength. Perspiration: If you have ever wondered why feet smell so much it is not because they are feet, but because they are always stuffed away in a sock and a shoe. You may be surprised that a hand stuffed into a brace all day will also smell exactly like a foot. It's uncanny. You can use a little powder on your palms to help, but what I found very helpful is to insert a little folded paper napkin between the brace and my palm. Not only did I find this absorbed sweat and protected my brace from odour, it also gave me some valuable added support. After a time I found that the brace was just not as comfortable without this little padding. This wrist brace on Amazon is similar to the braces I have used. It has a metal splint for good hand and wrist stabilization while allowing free finger movement. The price is super affordable and a lot cheaper than any braces I have purchased. It also has very good reviews. 15) Acupuncture: I have saved the absolute best for last as this was what healed me of my multitude of injuries in a short period of time. Acupuncture is the single most effective treatment for carpal tunnel and related injuries that I have tried. I was able to completely heal my carpal tunnel, wrist tendinitis, repetitive strain injury, shoulder tendonitis, tennis elbow and De quervain's tendonitis. I am a solid believer in acupuncture and have used it for various ailments always with one hundred percent success once I found the right acupuncturist. This is very important because when you find a good acupuncturist you they will be able to help you with almost any health issue. The first acupuncturist I visited was very well known in my city and was trained in both Canada and China. Each visit cost about $100 and she was not able to help me whatsoever. Although she was renowned in her field and has received much press and adulation, I felt virtually no relief from my visits with her. Frankly I could not afford to keep investing $100.00's a pop to see if it was ever going to help me. So I ventured on to find another acupuncturist a few years later. I cannot remember how I found the acupuncturist who was able to help me with my hand and arm issues, but he was a modest man who only charged about $30 per session and he was excellent for me. I feel so strongly about acupuncture that I have decided to share my story with you in hopes that it will lead you to not only a treatment for carpal tunnel and related injuries, but a cure! I developed repetitive strain injury and tendinitis around 1994 as a direct result of the kind of work I do...jewelry making. I know how devastating it can be to not only to go through the pain associated with hand injuries but, to have your livelihood or passion threatened. Back in '94 there where times when my injuries where so bad I had trouble opening the door to get out of my apartment. The pain would wake me up at night and it became very difficult to function let alone make jewelry. I went for physio, purchased braces, went to the chiropractor, iced and saw my doctor. Although the pain subsided and I did experience some improvement, my injuries persisted for years and I only just managed. In 2002, after eight years of wearing wrist braces for tendinitis and RSI, I developed shoulder tendinitis, carpal tunnel and De Quervain's thumb injury when my first child was born. Enough was enough, I was desperate to find a treatment for carpal tunnel and all my other injuries. I found myself a fabulous acupuncturist in Toronto. Within eight short weeks the numbness and tingling in my hands where gone and I stopped wearing both wrist braces entirely. To this day I still do not wear braces even when I have had high demands to produce jewelry in a short period of time. My hands are stronger than they have ever been. Occasionally if I have over extended myself and feel a little niggle I will put on a brace as a preventative measure. In one or two days I am fine and I have averted any issues. The wonderful thing about acupuncture is that it can work on all the issues you have in the same amount of time. Many acupuncturists also use herbs to enhance the treatment. Acupuncture has been such a godsend for me. It is what permitted me to have a second child. After two and a half years of trying to have another baby I saw an acupuncturist who specialized in fertility. In eight weeks I had two perfect cycles and I was pregnant. Hailey was born eight months later healthy and happy. I had her when I was 43 and I cannot imagine life without her. That is my sales pitch for Acupuncture. 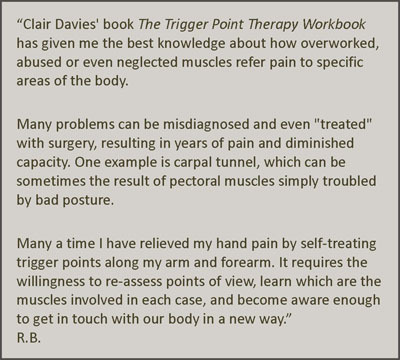 The only reward I will receive from telling you this is the knowledge that I may have helped you to get the fastest, safest relief and treatment for carpal tunnel or RSI. Acupuncture, as I see it, is the most effective carpal tunnel treatment and tendinitis treatment. ALL my injuries where healed. Please be sure that when you search for an acupuncturist you check them out. It is preferable to find one that comes well recommended. Talk to everyone you know and someone will know a good acupuncturist. Research online and make sure that any acupuncturist you see has good hygienic practices. One thing I have learned about treatment for carpal tunnel and how to prevent RSI and other related injuries is that the arms and hands have a tremendous capacity to heal. There were many times that I thought my hands where ruined and yet I have had a second and third and fourth chance for renewal. The body is remarkable...just don't ignore it and get the help you need! These are my experiences and your body is different from mine. Your injuries are different from mine and your overall health issues are different. You will need your own time to heal that is unique to your situation and the treatment for carpal tunnel or RSI that you choose. There is one more treatment for carpal tunnel that I have not mentioned and that is surgery. If the carpal tunnel is well advanced your doctor may recommend it, but it is my sincere hope that you will have success with a natural treatment for carpal tunnel. That's it. I hope that you have found my tips on the treatment for carpal tunnel and RSI/tendinitis helpful. May you always be healthy and take care of your hands.